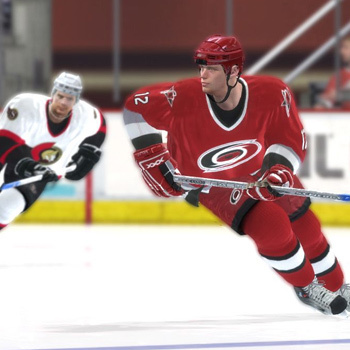 The Skill Stick gave you the power to deke the goalie in NHL 07 – now you can own the 1-on-1 matchup and undress opposing defenseman with complete control Use your stick to push the puck into space and walk around your defender. Once you're all alone in front, improved stick handling and shooting accuracy will give you the toolset to beat your goaltender for that decisive goal. Dynamic AI adjusts to your every move both on offense and defense, promising to challenge even the most skilled hockey players. The intelligent CPU scouts your tendencies like a coach and makes the necessary adjustments to shut down your money plays, forcing you to adjust your style of play. New analog speed control of the left stick gives you the variance you need to glide into the zone with control or get a burst of speed to step up on a defender. With new skating animations and responsiveness, you have the control to perform crossovers to maintain speed or carve tight turns for an immediate change in direction. 29 AHL teams – the top developmental league for the NHL – are exclusively featured and fully playable. Develop your talent with their minor affiliate until you are ready to call them up for the show. Be the GM and manage your team from the ground up while staying under the salary cap.